If your interests lie in observing the planets and stars that lie 1000s of light years away, then take a tour of the Byurakan Observatory located on the Mount Aragats. This tour will not only be informative but will also prove to be superfun. The observatory was established in 1946 and is equipped with a 2.6 meter cassegrain reflector, Schmidt Camera, and other smaller telescopes. The tour gives you thorough information about the observatory while letting you observe the sky through the telescope. Situated on a higher altitude, you will be welcomed by panoramic views once you reach the observatory. Visit this place to observe the fascinating vast space when you are in Byurakan. 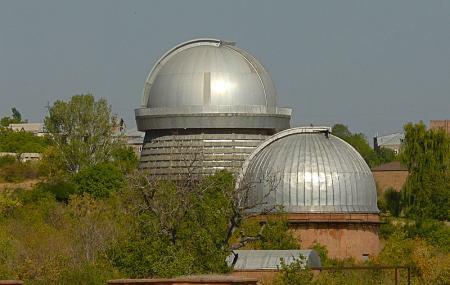 Explore Byurakan Observatory and other prime spots of the city using Byurakan trip planner. Hotels like Old Ashtarak, Garoon Host And Tours, Garoon Resort By Picnic and Villa Ararat will solve your problem of where to stay in Byurakan. Chalk out the best way to discover the city with Byurakan vacation packages. Check out various modes for how to reach Byurakan. Love this? Explore the entire list of places to visit in Byurakan before you plan your trip. Fancy a good night's sleep after a tiring day? Check out where to stay in Byurakan and book an accommodation of your choice. How popular is Byurakan Observatory? People normally club together Republic Square and Echmiadzin Cathedral while planning their visit to Byurakan Observatory. Interesting place. There is excursion for 40 minutes. During the tour you can see Saturn, Jupiter, the Moon ... Telescope 120 mm. During the daytime it is rather uninteresting unless you're really fan of telescopes and would like to have a peek at the one which at the time of construction in 1977 was worlds 7th largest optical telescope. Interesting place to learn about Armenian contribution to astronomy. We had a quick tour offered by a very enthusiastic scientist.